The Plymouth and South West Devon Joint Local Plan has now been adopted. Please visit the Adopted page for further information. Plymouth City Council (PCC), South Hams District Council (SHDC) and West Devon Borough Council (WDBC) submitted the Plymouth and South West Devon Joint Local Plan (JLP) to the Secretary of State on 31 July 2017. On this page you can keep up to date with the progress of the examination. Below you will find the latest information in the examination news and also all of the formal examination documentation in the Examination Library. The Inspector appointed to examine the Plan is Wendy Burden BA DipTP MRTPI. Inspector Yvonne Wright BSc (Hons) DIPT&CP MSc MRTPI has been appointed to assist Inspector Wendy Burden with the examination. The Programme Officer responsible for assisting the Inspectors with all aspects of the examination is Robert Young, who is independent of the three councils and works directly to the Inspector. Any correspondence or queries relating to the examination process should be directed to the Programme Officer. The hearing sessions are now closed, so the Inspectors will only request additional information that they consider to be essential to inform their consideration of soundness or legal compliance issues. They will not be accepting any unsolicited material or further statements from participants in the examination. At the close of the hearings the Inspectors asked the Councils to supply to them by 13 April 2018 any outstanding information and a list of potential main modifications to the Joint Local Plan. The Inspectors indicated that they may set out interim findings at a date to be confirmed. Please continue checking the website for all updates. If you have any queries email plymouthplan@plymouth.gov.uk or strategic.planning@swdevon.gov.uk or call 01752 305477. Please note that due to the severe weather the examination hearings in Tavistock on 1 March 2018 have been cancelled. We will be letting everyone know when the sessions are rescheduled in due course. Please note: These additional evidence base documents are an evolution of the documents already within the Examination Library. Please note: This document updates TP3 which became out of date when the updated housing trajectories to the March 2017 point (TP3E, TP3F, TP3G) were produced in response to EXC2. Please note: These documents were published alongside the JLP consultation in July 2016, and were superseded by the SHMA Part 1 (HO13), they're being re-published because they informed the early stage of JLP preparation and are referred to in the revised Housing Topic Paper (TP3(rev)) which is the audit trail about the use of evidence which informed the preparation of the JLP. Please note: This document was produced by PCC's Housing Delivery Team to assess disabled housing need in Plymouth and quantify estimates for the delivery of specialist forms of housing (assist delivery of specialist forms of housing). The Councils believe it assists to clarify the approach taken in the JLP in respect of questions raised by the Inspectors in Matter 10, and therefore has been added to the Examination Library. Please note: The previously published transport evidence base includes a number of position statements between the three Highway Authorities (which form the JLP Transport Strategy Working Group) within the JLP area (and accompanying model output reports) which reference that further statements and modelling reports would be produced. As set out in the evidence base the transport work informing the delivery of the JLP is an iterative process and the work of the Transport Strategy Working Group has continued post publishing the evidence base at the time of the Regulation 19 consultation and since the submission of the JLP. The additional evidence base documents which have been added to the library are an evolution of the documents already within the Examination Library. The Examination Library provides access to all of the documentation associated to the examination of the Local Plan. It will contain all of the documentation associated with the hearings and formal examination correspondence. As well as providing links to the documents below we've also produced a further list which you can download and save for reference. Further versions of this list (examination library) will be produced as and when we receive/produce further documentation throughout the examination. Please note: This document was updated on 19 March 2018 due to a missing modification (HM39). No other change was made. Please note: This document replaces both EXD25 (formerly SUB9) and EXD22 (formerly SUB10) which became out of date during the examination hearings which took place from January to March 2018. Please note: A new appendix (Appendix III(a) - EXD25A) was added to the Integrated Assessment during the examination which sets out the SA/SEA framework criteria and issues to consider as agreed with Natural England in SCG6. Please note: This document was superseded during the examination by EXD25B to take into account a change to the document as agreed with Natural England in SCG6. The published transport evidence base includes a number of position statements (T24, T25, T28, T29) between the three Highway Authorities (which form the Joint Local Plan Transport Strategy Working Group) within the Joint Local Plan area (and accompanying model output reports) which reference that further statements and modelling reports would be produced. As set out in the evidence base the transport work informing the delivery of the Joint Local Plan is an iterative process and the work of the Transport Strategy Working Group has continued post publishing the evidence base at the time of the Regulation 19 consultation and since the submission of the Joint Local Plan. This section looks at all the past consultation/engagement phases which inputted into the final Plymouth and South West Devon Joint Local Plan. Please read the Statement of Consultation (July 2017) to get a more detailed breakdown of each stage of consultation. The Plymouth Plan Conversation (up to July 2013) began the consultation process of the Plymouth Plan. Plymouth City Council started by setting up a 'What's the future' pop-up shop which proved to be a fantastic event which generated a huge amount of positive feedback. The Council also travelled around the city with a sofa where everyone was invited to come and have a sit on the sofa and chat about the future of Plymouth! All the comments and suggestions were collected and processed and can be viewed on our consultation portal. 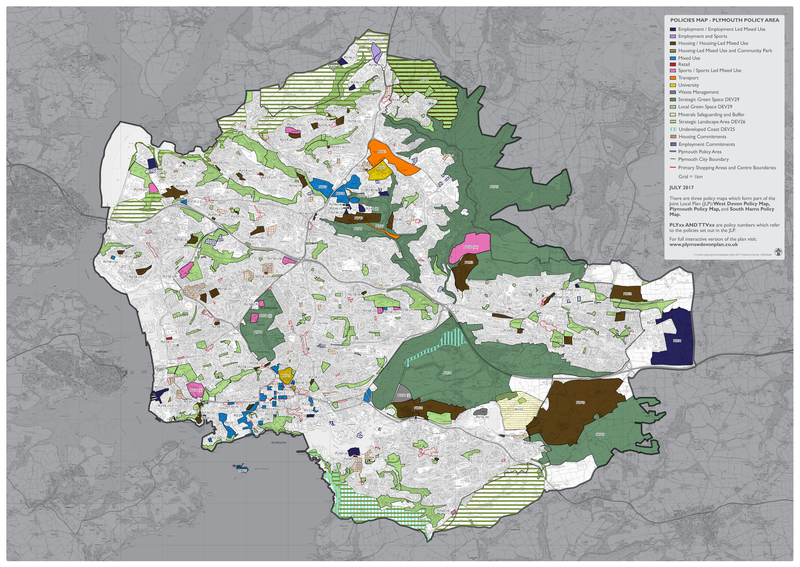 Plymouth City Council produced 24 topic papers and eight area assessments to further inform conversation and collect further comments on the city which later fed into the overarching Plymouth Plan document. To view the comments which were submitted visit our consultation portal. Using all the comments and evidence base collected previously, a draft Plymouth Plan policy document was produced which painted an image of what the city could look like in 2031. It set out a course to move this city closer towards that vision as well as setting out the city's strategic role as a regional city and a major economic driver for the heart of the south west. Following the Plymouth Plan Check-up, the Plymouth Plan Part One was approved by full council as the one strategic document for the city. After the Plymouth Plan Part One was approved, attention fell on the land in the city. PCC consulted on eight Plymouth Plan toolkits which included data about each area to help inform conversations about each part of the city. PCC also asked local residents and groups to nominate local green space for protection through this process. In South Hams, two phases of engagement were undertaken to support the preparation of Our Plan (South Hams) before the decision was made to write a Joint Local Plan. In 2012, work began to consider the implications of the National Planning Policy Framework (NPPF) for South Hams and a range of options were considered by Officers and Members during the following months and in 2014 work began in order to consult on the scope of the plan and gather local knowledge through a series of newsletters. View the comments and consultation responses. In December 2015 South Hams released an eNewsletter 'Neighbourhood Planning News' to clarify the links between Our Plan and Neighbourhood Plans. On 7 January 2016, Issue 7 of the Our Plan newsletter was launched to provide an update on the Our Plan process. The newsletter published an updated potential timescale for the Plan, as well as launched a Call for Sites exercise, which closed on 22 February 2016. In West Devon, three phases of engagement were undertaken to support the preparation of Our Plan (West Devon) before the decision was made to write a Joint Local Plan. In 2012, work began to consider the implications of the National Planning Policy Framework (NPPF) for West Devon and a range of options were considered by Officers and Members during the following months and in 2014, work began in order to consult on the scope of the plan and gather local knowledge through a series of newsletters. On 20 January 2015 a draft Plan was taken to Full Council for formal approval and the Regulation 19 consultation for Our Plan West Devon ran between 26 February and 13 April 2015. In December 2015 West Devon released an eNewsletter 'Neighbourhood Planning News' to clarify the links between Our Plan and Neighbourhood Plans. On 7 January 2016, issue 7 of the Our Plan: West Devon newsletter was launched to provide an update on the Our Plan process. The newsletter published an updated potential timescale for the Plan, as well as launched a Call for Sites exercise, which closed on 22 February 2016. The first consultation headed towards a Joint Local Plan. Plymouth produced a map with an accompanying booklet showing all the sites in the city which were proposed as a development opportunity or as a site which needs to be protected as greenspace. Plymouth also asked for comments on draft area visions for the City Centre and Waterfront, Derriford and Northern Corridor and Eastern Corridor Strategic Growth Areas. 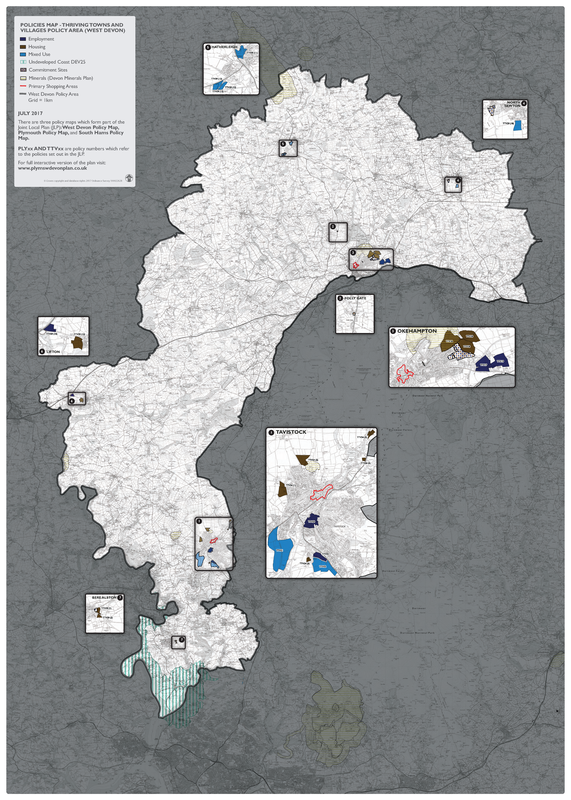 In South Hams and West Devon a 'Thriving Towns and Villages' booklet was produced which looked at the possible land for development in these areas. To view the comments submitted please visit our consultation portal. After receiving numerous comments on the Joint Local Plan it was decided that a second phase of consultation would take place before publishing a draft plan for comment. A topic paper and extra sites were consulted on and a summary report was written. The final consultation on the Plymouth and South West Devon Joint Local Plan ran for six weeks from 15 March 2017 until midnight 26 April 2017. To view comments on the Joint Local Plan during this phase please visit our consultation portal. In addition to the Plan itself, comments were also asked for on a Draft Integrated Assessment (incorporating the Sustainability Appraisal (SA), and Strategic Environmental Assessment (SEA), the Thriving Towns and Villages Settlement Boundaries and a Review of City, District and Local Centres in Plymouth.